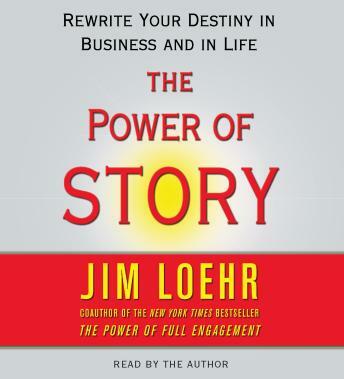 With Change Your Story, Change Your Destiny Jim Loehr's objective is to show how the stories we tell represent the single most powerful tool we have for managing energy and achieving any important mission in life. For the purposes of this audiobook, a story is simply the interpretation we give to our world of experience. It represents the meaning we give to whatever happened to us in life. For example, having been in an automobile accident or having lost your wallet is what actually happened, and the meaning or significance you give to the accident or lost wallet is your story. Scores of people have explored the impact of storytelling on others as well as on how the mechanics of storytelling can be improved to enhance the desired effect. From a business perspective, considerable attention has been given to helping leaders improve their storytelling skills to enhance their organizational effectivenss. The case will be made with this audiobook that more important than the impact of storytelling on others is the profound effect storytelling has on the person telling the story, whether in enhancing, for example, leadership capacity or sales effectiveness or in entirely different dimensions of life. Excellent book and life changing ideas. Must listen.